Mulching is one of the easiest ways to keep your trees healthy, and an important part of spring tree maintenance. Mulch helps protect plant roots from the sun. It will also keep the soil cooler for a longer period of time, which means your trees won’t leave their winter dormancy too early. Mulching also keeps soil from drying out too quickly. By conserving moisture, the need for water is also reduced. Other benefits of mulching include protecting the soil from erosion and preventing the growth of weeds. As the mulch begins to decompose, it will release organic material (nutrients) which creates food and shelter for beneficial soil organisms like earthworms. 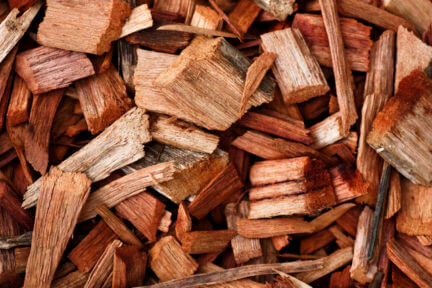 Many different types of materials can be used for mulching, such as wood chips, shredded bark, straw, pine needles, peat moss, grass clippings, compost, cardboard, newspaper and manure. There are also non-organic mulching materials such as plastic sheeting. Mulch is typically spread in a two to six inch layer around the tree. Before mulching, remove any grass within a 3 to 10 foot area at the base of the tree depending on its size. Spread the layer evenly, making sure it doesn’t touch the tree trunk. Always remove any mulch that ends up on your grass, or the grass underneath it will die. Any older, thick and matted mulch may need to be raked to ensure water and air can pass through to the tree’s root system. Mulch that contains a large amount of nitrogen will need to be rotated. Without rotation, decomposition will occur at a faster rate. The decay can change the woodsy aroma of the mulch to a sour smell of ammonia, vinegar and sulfur. The smell will dissipate once the mulch is exposed to air, but if it’s placed on the soil before the dissipation occurs, it can kill the tree. To avoid costly mistakes, get more tips on mulching from a big tree specialist.